Based on mutagenesis studies and molecular dynamics simulations on the GnRH receptor and P2-AR, Ballesteros et al. (46,63) suggested that the conserved R3.50 of the DRY motif is constrained by an ionic interaction with the preceding D3.49 in inactive forms. The crystal structure of inactive rhodopsin suggests that the carboxylate group of E3.49(134) forms a salt-bridge with the guanidium group of R3.50(135) (ref. 3; Fig. 4A). Therefore, it is inferred that disruption of the interaction between D/E3.49 and R3.50 would lead to activation of the receptors, mimicking protonated states of D/E3.49. HT2C receptor (70), and T313 in the 5-HT1B receptor (71) (see Fig. 3B). In the a1B-AR, all 19 possible amino acid substitutions at the 6.34(X3) locus (A293) led to varying levels of constitutive activities, with the A6.34(293)K mutant demonstrating the highest activity (36). The effect of a mutation at the 6.34 locus can be dramatically different depending on the nature of the substitution (44). 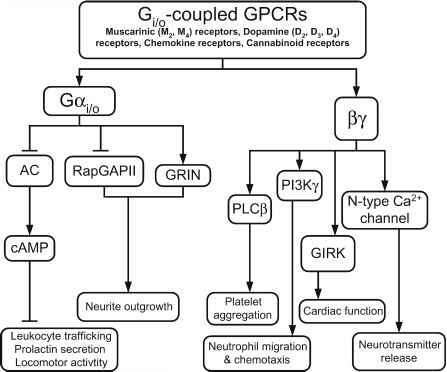 For the ^-opioid receptor (Fig. 5), T6.34(279)K mutant dramatically enhanced agonist-independent activity, whereas T6.34(279)D mutation did not, although it almost abolished the G protein signaling (44). The results were interpreted in the structural context of a rhodopsin-based model for the ^-opioid receptor. The interaction of T6.34(279) with R3.50(165) through a hydrogen bond in the ^-opioid receptor stabilizes the inactive conformations (Fig. 6A). The T6.34(279)K substitution disrupts this interaction because of charge repulsion and supports agonist-free activation (Fig. 6B), whereas T6.34(279)D mutation strengthens this interaction by forming an even stronger ionic bond that keeps the receptor in inactive states (ref. 44; Fig. 6C). Fig. 5. 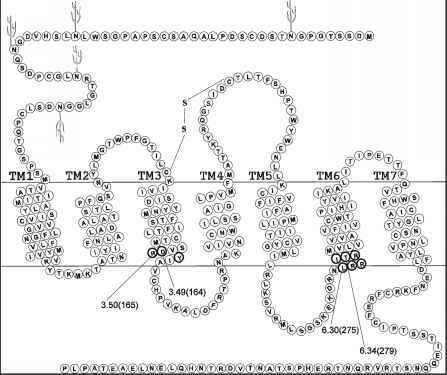 Helical net representation of the rat m-opioid receptor. The D/ERY motif and X1BBX2X3B motif are highlighted with dark circles at the cytoplasmic ends of TM3 and TM6, respectively. rotropin receptor (78) leads to constitutive receptor activation, which causes gonadotropin-independent familial male-limited precocious puberty and hyperfunctioning thyroid adenomas, respectively. 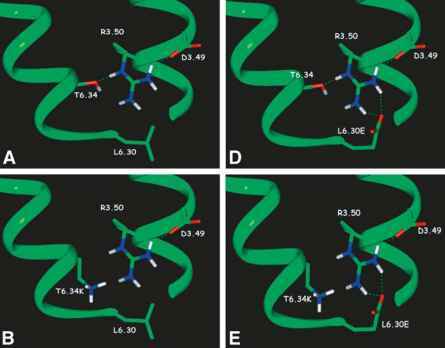 The activation mechanism of the D6.30(564) mutant of the lutropin/choriogonadotropin receptor has been suggested to result from the loss of R3.50(464)-D6.30(564) ionic interaction (79). The finding that substitution of D6.30(564) with Glu did not lead to constitutive activation (77,80) is consistent with the interpretation. Therefore, the D/E6.30(X1)-R3.50 interaction may constitute a constraint of inactive states for many 7TMRs, which is removed in the process of receptor activation (73-75,79).